Once again, the holiday season is upon us, and with it comes get-togethers with family and friends. With so much going on this time of year, hosting a holiday party can be somewhat overwhelming. To keep things simple I will often serve appetizers and wine instead of a big meal. Any good host/hostess knows when it comes to pairing appetizers with wine a well thought out menu is important. In order to keep guests happy I prepare bites that work well with both a red and white wine varieties. 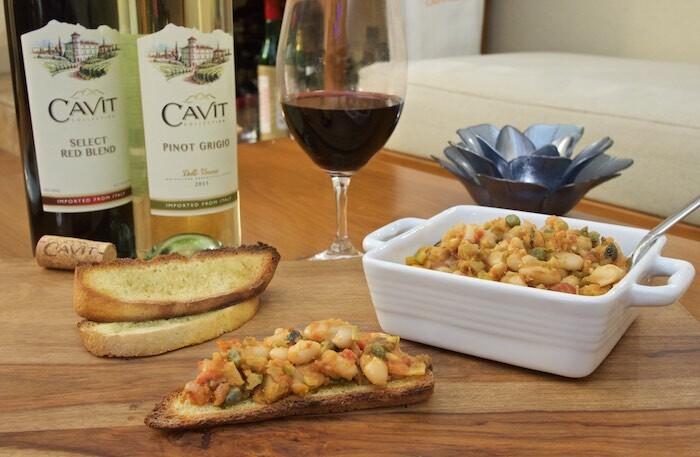 As a hearty appetizer, White Bean, Olive & Caper Crostini, is a great choice. 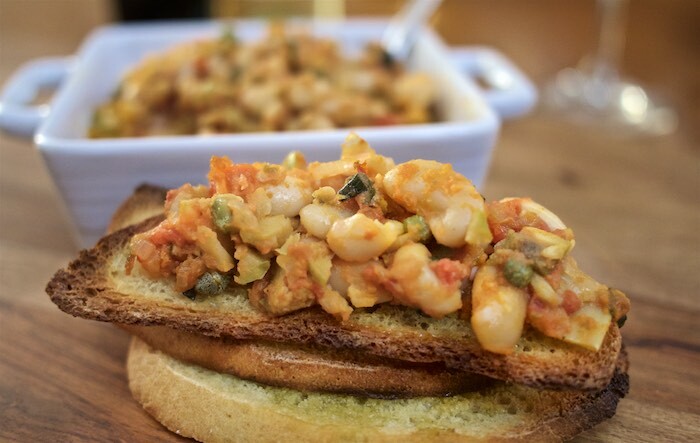 A delicious combination of cannellini beans, capers, olives & tomato are served on grilled bread drizzled with olive oil and rubbed with garlic. For the wine pairing, Cavit winery makes a Select Red Blend and a Pinot Grigio which both complimented this appetizer well. The citrus forward Pinot Grigio, which is light and refreshing, balances the saltiness of the olives & capers. My preference though is the Select Red Blend, it's diverse array of grapes makes it extremely food friendly. This red wine paired perfectly with the robust tomato flavor in the appetizer. Cavit winery, which is located in Northern Italy, was founded in 1957, and has earned a reputation as a cutting-edge leader in wine-making. Cavit, is a large co-operative composed of a number of small wineries consistently producing affordably priced premium wines that have won hundreds of awards. You can taste the quality in every sip of Cavit wine. If you are looking for a crowd-pleasing appetizer, that will appease both red & white wine drinkers, look no further. Heat a large skillet with olive oil over medium heat. Add the onion and sauté, until just beginning to soften, 2 to 3 minutes. Add the garlic and crushed red pepper and sauté until fragrant. Pour in the canned tomatoes and bring to a simmer. Add the cannellini beans and cook 5 minutes. Preheat oven to 450 degrees. Bake bread slices for 5-7 minutes or until lightly browned. Rub bread liberally with garlic clove and drizzle with extra virgin olive oil. Love the recipe. I adore capers. wow this recipe looks absolutely amazing! Love crostini recipes! Great recipe for holiday entertaining! I could eat crostini at every meal! I love beans and olives together! I could eat this whole batch :). This is perfect. We know very little about wine pairings so we usually just serve both and let people choose! So an appetizer that works well with both is awesome. This looks SO good. I have a white bean crostini recipe which calls for a blending of the beans to create a type of 'hummus' consistency -- It's a hit. Will try your recipe and certain to become another fave-- Love all the ingredients! Thanks Theresa. Love crostini and this combo sounds awesome! Well wine, bread and cheese are my top three things for entertaining. These little bites sound so delicious. I could just eat stuff like this instead of the meal. Yumm!! Beautiful, healthy and tasty app. Delicious with wine. On on board! Perfect for all of these holiday parties I have to attend! So good! Crostini are some of my favorite appetizer foods! And this recipe certainly looks delicious. Those sound so flavorful, I love the ingredients! The capers in this crostini topping sounds so delicious! I love beans, this looks perfect for holiday parties! Love the capers and cannellini beans in this! Best it would be great with crackers too! These look like such a great appetizer.